This is a scan of the World of Two Moons map from the game, with my drawing on it showing where our holt was located, as well as the island of the holt of Sea Elves. In my junior high school, 1984-1986, there were about ten of us who were fans of a comic book series known as Elfquest by Wendy and Richard Pini. The Elfquest Role-Playing Game was released in 1984, and we decided to play it. Luckily I was the one who bought the actual game, so I still have it! We created a holt, a tribe, and characters. I don't think we played the game that much, but creating the story and drawing the characters was a lot of fun! The holt name was Oakhaven, and the tribe was the Catriders, since our bond beasts were Long-tooths (saber tooth tigers). We lived on the coast, so some elves in the tribe had bonded with Waveriders (dolphins). A tribe of barbarian Sea Elves was known to us, and we to them, but we didn't have too many dealings with them. One of my friends wrote a long history of the Catriders of Oakhaven, but sadly I do not have a copy of it. It was brilliant, though! “Surefoot is named this because of her Finding power and her Exact sense of direction (attribute roll). She is extremely agile and can track almost anything due to her Finding power. Her abilities are not yet fully developed since she is still young. She is very outgoing, and sometimes acts on impulse alone. She has good leadership abilities, and she can find solutions to almost any problems that confront her tribe. She usually uses good sense in handling problems, but sometimes can be irrational if passionately set on one idea. She has a gentle, empathetic side and she is merciful. She has a strong instinct of protectiveness for her tribe and her race. Surefoot and Flame are lifemates and have a 5-year old son, Kindle. Bond-beast: An albino Long-tooth named Snowpelt. I never drew a picture of Snowpelt, but he is described on this character sheet. Jewelry: thin metal headband with gold 5-point star at forehead"
Here is the first drawing I did at age 13 (1984) of Surefoot. Early on I'd given her two bond beasts, a wolf and a Wavedancer. 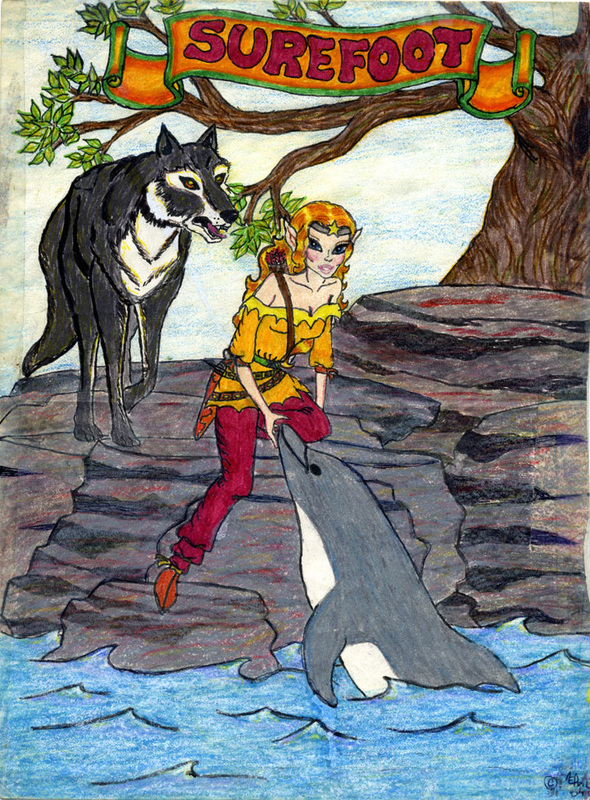 I copied the wolf, tree and rocks from the Elfquest comics. “Flame is called this because of his power of Firestarting. It is as yet undeveloped, but he is proud of it because he is the only known elf since the High Ones' coming to possess this power. He is energetic and likes to show off. His mischievous nature is countered by Surefoot's calmness. There is a romantic side to him as well. Flame's bond beast is a golden Long-tooth named Thornlasher. “Heartsing is called this because of her strong power to Deep Sense, and thus aid her tribe mentally and soothe emotional pain. She is unaware of her power to Mind-Snare, since she has never needed to use it. She lives a generally peaceful life; her heart is with the sea and she rarely goes on hunts in the forest, preferring to provide the tribe with their seafood. Her favorite pastime is to sit on the rocks at low tide and meditate (or use Astral Projection), or study the sea patterns and its signs (like Suntoucher studies the sun). She has the strongest sending powers in the tribe. Her father was a barbarian sea elf and her mother is a Catrider. They were Recognized but did not become lifemates, and her father chose to stay apart from her and her mother. Her sea-elf blood partly explains her strong Sending powers and her closeness to the sea. She is considered the most beautiful elf of the tribe. She sometimes feels lonely, but the sea is almost a lifemate to her. She never speaks aloud, for she was born deaf. Some may consider this an attribute, for it seems to heighten her other perceptions and her power to Deep Sense. Her bond beast is a Wavedancer named Seaskimmer. Jewelry: necklace with shark's teeth, shells, etc. and gold hoop earrings with shark's tooth hanging from one"
​Before Flame was created, Surefoot's lifemate was a character named Starbow that I had created for a friend who chose the name and appearance. My friend in a fit of creativity wanted his character to look exactly like Cutter. 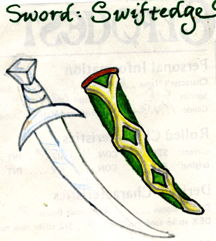 (And Surefoot bears a striking resemblance to Joyleaf.) Here is my drawing of Surefoot and Starbow. It is based (also at his request) on the back cover of EQ Issue #4. He ended up never playing the game, so I created the character of Flame to take his place. This drawing was done in 1984. ... and that's it for the Catriders of Oakhaven! I did do a lot of other Elfquest drawings, most of which I gave away or sold because they'd been 'commissioned' by my friends. Here is one from 1984 that I kept—it's mostly a conglomeration of some of Wendy's drawings.